There's some new stuff that's come out recently from UGH! Models. I received these today. New stuff from UGH! Models! These are all 1/1000 scale, of course, and brand new parts. There's the K'T'Inga Mk II, and four different types of new nacelles for Federation ships in the Movie and Lost Years Era timeframes. 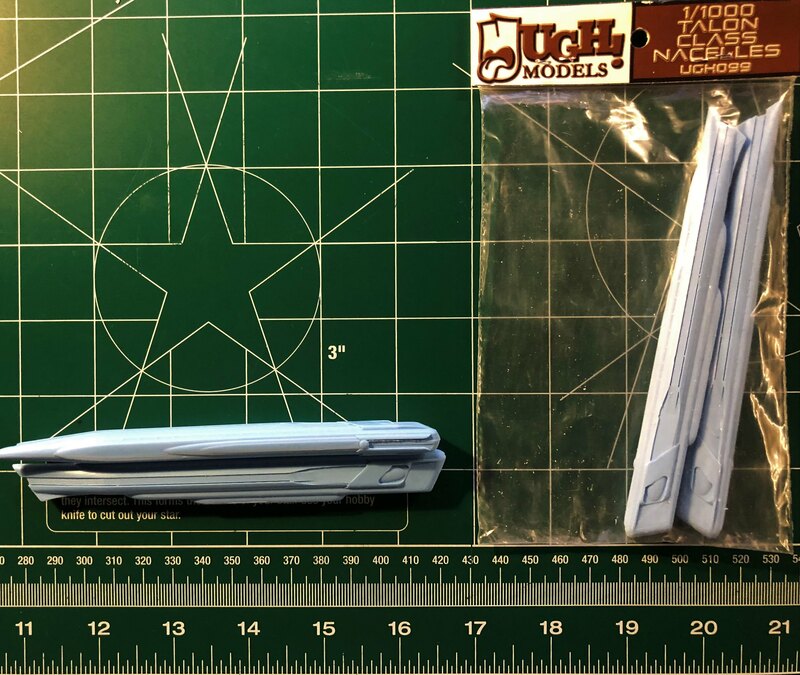 First up is the Fafnir-class nacelles. They're a sort of mix of Excelsior and Ambassador designs in the nacelles. The Fafnir set has a Bussard collector built in to the front of each nacelle. I received two sets of these, as I really like them for a couple of kitbashes. 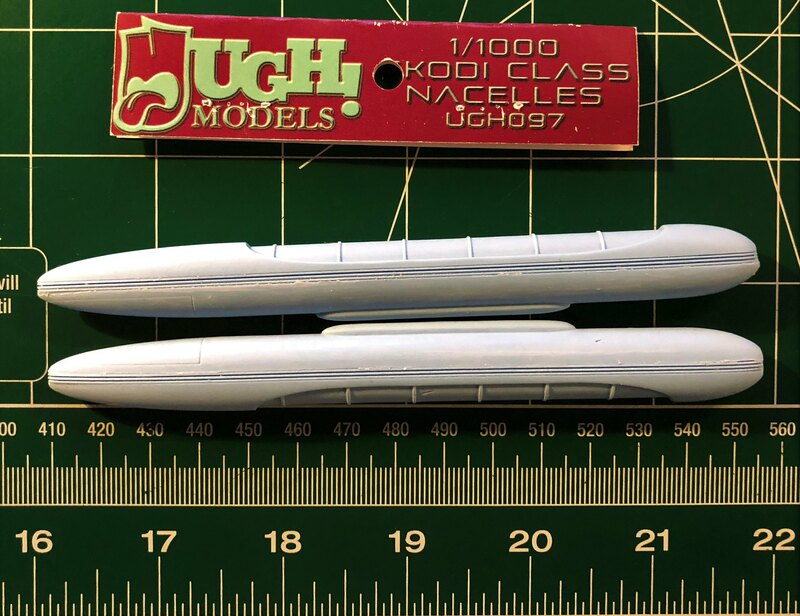 Next is the Kodi-class nacelle. These are like the Fafnir, tho without the Bussard collector. Next up is the Talon-class nacelle. It's more like a Refit-style LN-64, but with wrap-around intercoolers and no fins for the RCS thrusters. I received two sets of these, as well, for the same reasons as the Fafnir. 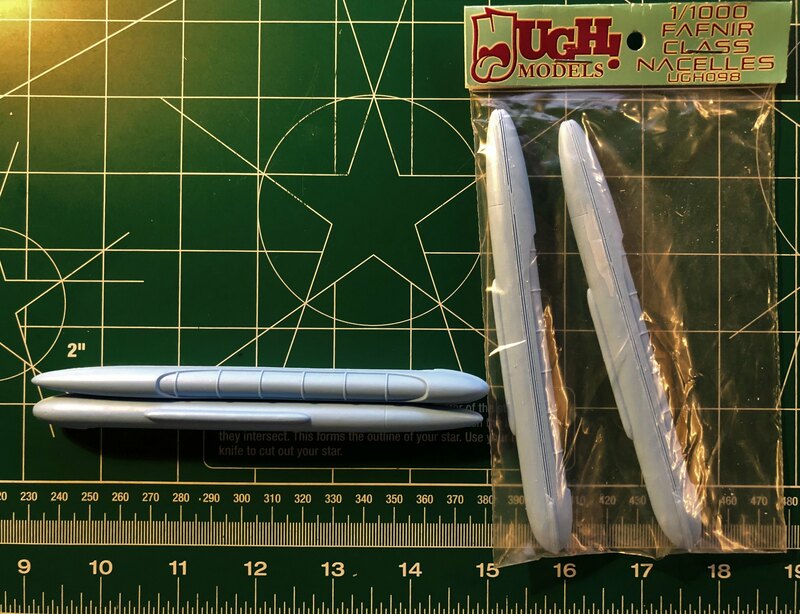 And last from this set of pics is the Mako-class of nacelles. These things look fast without even being mounted on a ship. Imagine how fast they'll make your ship go! I'll post some pics of the K'T'Inga later. K'T'Inga pics! This will eventually be the IKC Amar. With the previous resin 1/1000 scale K'T'Inga kit release. 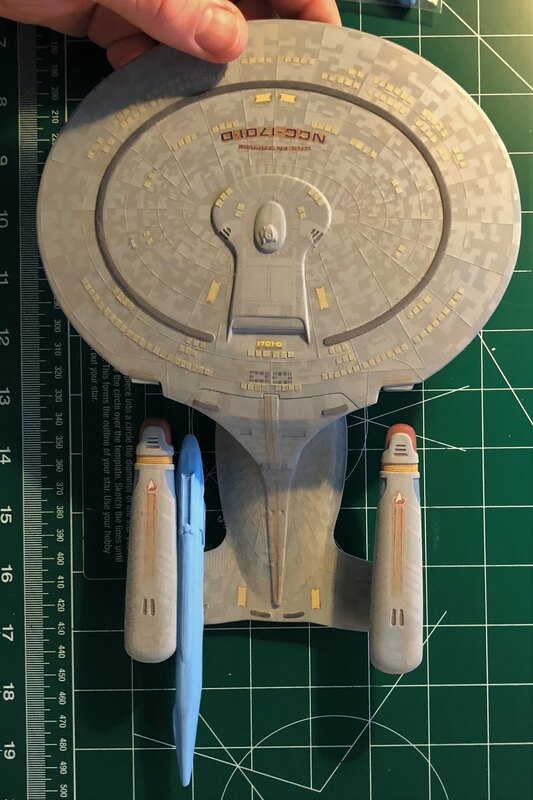 The built kit was originally sold by Starship Modeler, then The Delta Quadrant, and finally UGH! Models had the masters and produced it. This new K'T'Inga Mk II, tho, is MUCH better. It's a CG built model, cast from printed parts. It's slightly smaller, as you can see, tho still a nice size - and also accurate to the official ST:TMP Blueprint set at 218m-ish. Showing the stern of the ship, specifically the impulse vents and the open shuttle bay. There is a door piece you can install if you don't want to show an open bay. However, the kit comes with a Klingon shuttle, as well. It's flatter than it's Federation counterparts, tho might be more of a fighter than a shuttle, I guess. I'll pull it from the bag later and post pics of it, as well. Close up view to better show the upper engineering hull. 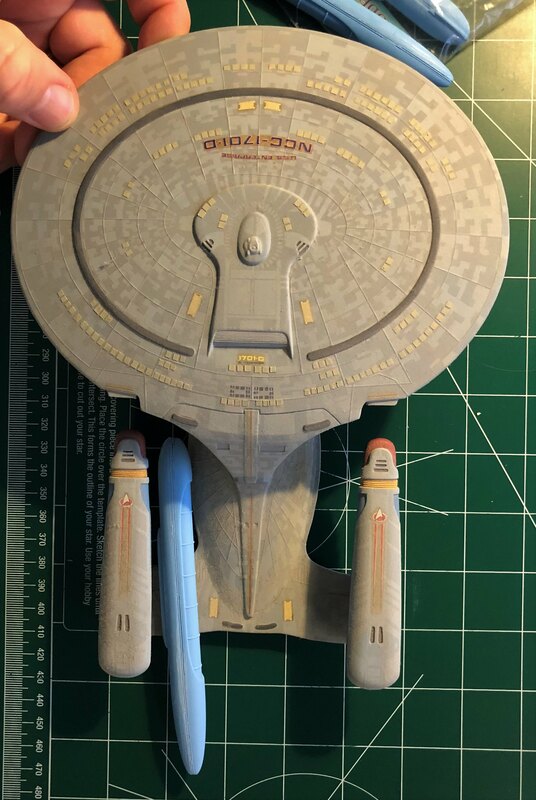 K't'inga looks dandy I do hope they bring that in 2500, I know they won't be able to do the shuttle with it but I don't mind that. 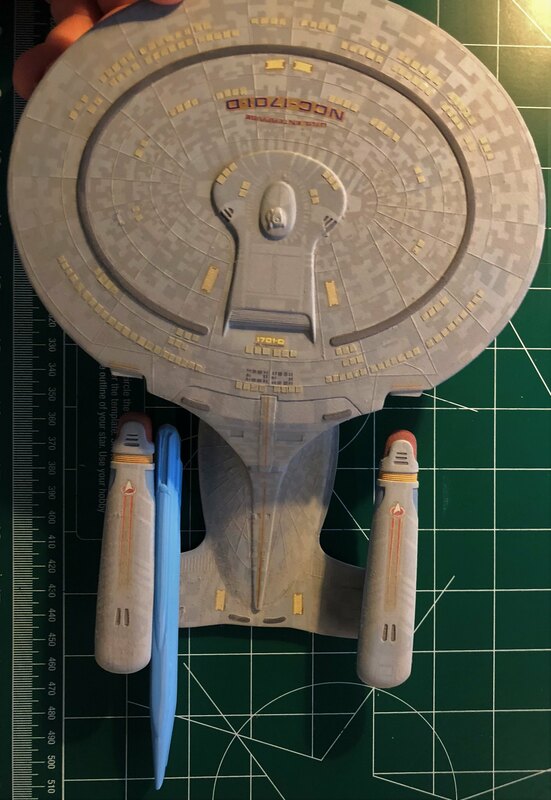 The nacelles all look good but need a closer view of the Fafnir to make my mind up whether that or the Kodi would look better on the Excelsior. I’ll take a side-by-side pic for you later today or tomorrow. Last edited by mophius on Tue Jun 12, 2018 7:04 pm, edited 1 time in total. Soitenly! And you're most welcome. LMK if this doesn't get you what you want/need and I'll try and come up with something that does. Bonus view of what the Fafnir will kinda/sorta/maybe look like when lashed onto a Refit pylon! Maybe sorta like this? If by "Sacred Scale" you mean 1/2500, that is. I don't have any 1/1400 ships in the house, if it's in that scale. This is the Fafnir-class nacelle. Obviously, sort of a sloppy pic, but I was only born with two arms/hands, unfortunately. If I had it to do over again, I'd have been born with four arms. I have a couple other 1/2500 ships, tho not many. If you need another view, I can try and get a side view when I can wrangle one of my kids to help me. Kewel. I look forward to seeing what you come up with on your 'bashes with these nacelles! Those are "Skodi" class nacelles, not Kodi. The S got punched out when they made the hole to hang them at WF.